Our black and white miniature girl, Allie, and sweet little toy boy Vinny are expecting their litter of poodle babies on June 11th., 2019. This combination will give us a variety of colors from red and red sable, like Dad, to potentially some parti-color puppies like Mom. We could also see phantom, black and apricot. Since Allie weighs 15 pounds and Vinny weighs in at less than 9 pounds we will see puppies maturing in the 10 to 12 pound range but will most likely also see a few of the puppies inheriting Vinny’s diminutive sire’s size and mature much smaller — perhaps in the 6 to 8 pound range. Since Isis and Bandit are expecting a litter of Standard Poodles at the same time we decided to breed standard poodle “Dream” to our beautiful Robbie for a litter of poodles that will mature in the “Moyen” size (French for “medium”). These purebred, AKC registered babies should mature between 23 and 30 pounds — still technically a “standard” poodle but much smaller in size than the average American standard poodle. As both Dream and Robbie are red with white markings and Robbie carries the parti-color factor in his genetic make-up I am expecting red puppies with white markings, apricot puppies with white markings, and — hopefully — some red or apricot parti-color puppies as well. If interested in this litter of puppies let Terry know ASAP. Dream typically has only 6 puppies in her litters and this combination of parents will produce ideal companion, therapy, and ESSD service puppy candidates. These puppies will be very calm, sweet-natured and willing to please. 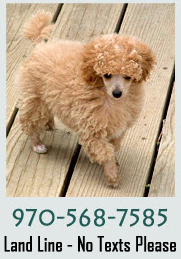 Call Terry at 970-568-7585 (landline, no texts, please) to reserve your puppy. Toy Goldendoodles on the Horizon! We have bred Skye (standard poodle) and Augie (mini goldendoodle) for an upcoming litter (due May 11th.) of mini-medium goldendoodles. Since Skye is a red with white markings “parti-carrier” (meaning her genetic color potential includes parti-color) and Augie is a red and white parti-color doodle we should see deep red puppies and apricot puppies with white markings and some red and/or apricot parti-color babies. These puppies should mature in the 26 to 30 pound range (a few may be a bit bigger — 32 to 38 pounds) and be sweet, friendly, calmer-than-average and very trainable for many endeavors — therapy dog, ESSD, obedience competition and of course — they will make WONDERFUL children’s playmates and family companions. These puppies will range in price from $1500 to $1800 with the loud-colored parti-color puppies being the more expensive puppies. We have also bred our stunning Houston daughter, Jazz, with Robbie’s deep red minidoodle son, Yankee, for a litter of Mini-medium doodles due around the end of May, 2019. Jazz is red and Yankee is deep red. Guess what color the puppies will be! YES! VERY RED! Jazz weighs 38 pounds and Yankee 23 pounds. These pups will mature between 24 and 35 pounds with most of them around 30 pounds. Jazz is calm, sensitive, very dignified and extremely intuitive. Yankee is a free-spirit, fun, sweet-natured, wants to play and wants be involved in whatever his family is up to. Both of these dogs have never met a stranger and are incredibly tolerant of everything I’ve exposed them to. Toddlers that pull and grab or puppies that pounce and get in their food bowls. These parents should produce some pretty incredible, tolerant, accepting and sweet-natured puppies. Remember, it is never to early to put a deposit on an upcoming litter.